My Second Love: Should Christians celebrate Halloween, Harvest Festivals or Reformation Day? 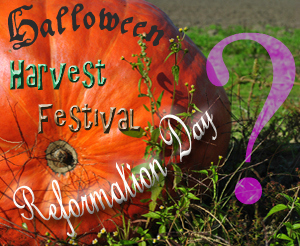 Should Christians celebrate Halloween, Harvest Festivals or Reformation Day? Every year about this time, there's some controversy about what Bible-believing Christians ought to celebrate. Is it a sin for a Christian to celebrate Halloween? Is it better to participate in a church Harvest/Fall Festival instead? What in the world is Reformation Day and why do I keep seeing, "Happy Reformation Day" on Facebook?